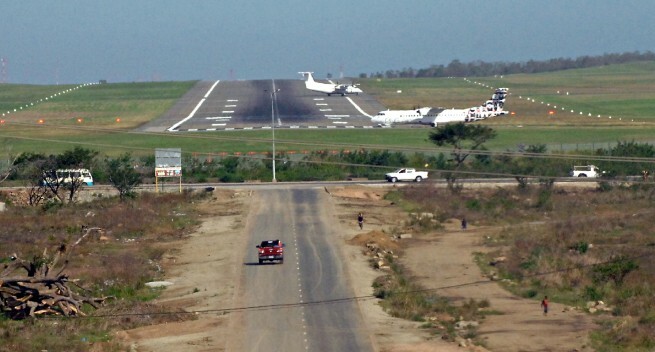 HOUSING developments taking place around Port Moresby Jackson International Airport are in breach of Civil Aviation safety rules, says the Civil Aviation Safety Authority. It warned yesterday that many lives would be lost if an aircraft crashes on take-off or landing into these housing estates which have developed in recent years without Civil Aviation approval. Increasing number of houses are being built in the flight path of the planes using the airport and were in breach of airport safety rules, Civil Aviation Safety Authority director and chief executive officer Wilson Sagati said. Developers or persons who are currently constructing buildings there have breached Civil Aviation regulations, he added. Mr Sagati singled out developers of Kennedy Estate who he said had not complied with the Civil Aviation rule part 77 which states that to construct or to alter a structure near the airport requires the Civil Aviation director to be notified. He added that the structures in question are located below the flight path and air space of Jackson International Airport. Mr Sagati said that under the Civil Aviation rule the director determines a structure to be a risk in navigable airspace if it is 120 metres or higher above ground level. He said the growth of "obstacles" – housing developments – around an airport would render the runway "unusable". "The Kennedy Estate in Moresby Northeast electorate is located directly below the flight path and in the event an aircraft taking off or landing experiences engine failure, the consequences could be very serious. "The risk being exposed to people residing at Kennedy Estate is very high and I hope that those who have made the decision to live there have taken into account the worst case scenarios. "CASA will be encouraging National Airports Corporation and National Capital District physical planning board to be involved in the approval process of proposed buildings closer to the airport. "The acquiring of land to build properties around the airport airspace is not in my area to comment," Mr Sagati said.